In this article, we will strive to provide you with a clear understanding of exactly what communication strategies are and why they are crucial in the development of your business. In essence, communication strategies are the plans of how you are going to communicate with the public, stakeholders or even colleagues, and they relate to a specific event or issue. Whilst it may seem like quite a standard thing in an organisation, the fundamental success of a business can hinge on the way certain information is communicated. Communication strategies are often simply taking the time to identify some sort of communication breakdown or lack of efficient communication somewhere in your organisation and acting upon it. Then, the most appropriate way to communicate the message or information is determined and you move forward by enforcing this approach. This is the most common tactic for simple issues which do not generate a lot of concern. However, if your business is, for example, something that could cause public concern if it came out with some worrying information, this would be a time when a more formal written strategy would be required, ensuring that all stakeholders are reached and key points are communicated effectively. These examples on their own outline why communication strategies will benefit your organisation greatly and help cut out misinterpretations and other problems. To find the right communication strategy, there are several things you must consider and several things the chosen strategy must include. Firstly, you should be clear on what the area of communication you are looking to overhaul is in existence for; what are its objectives? You also need to locate the people who will need to be aware of the message or information that is being communicated and work out how it will be distributed to them. Moving on, you then take into consideration all the potential communication methods and choose the one best suited to the situation. It is mainly at this point where external help could be very helpful. Furthermore, it is important even at this stage to look to the future and choose your method of obtaining feedback on the changes. 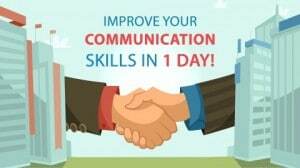 Finally, the most important thing to remember throughout the process is just how important communication is in a business in increasing awareness, encouraging action and many other factors. Robert Bacal works in many lines of business, including management and performance appraisal, and recognises how important communication strategies are in all of them as he mentions in his articles. Michael Douma is founder and executive director of IDEA.org, and talks about the part communication strategies can play in your corporation. Train in a Day can create bespoke courses which will help implement effective and innovative communication strategies into your business.